Every savvy Internet Marketer knows that ‘Content is King’. Good content will lead to engaged readers, responsive subscribers, authority status, high search engine ranking and more sales. If you are serious about exploding your blogs earning capacity, then it is essential that you optimize every link on your blog to boost clicks and sales.. Attention Span – 95% of site visitors leave within 10 seconds of landing on a site. Unless your content grabs their attention, they are gone forever. Blatant Affiliate Links – Site visitors love to buy but they hate being sold to. Blatant sales pitches or affiliate links will not get clicks. Lack of quality SEO traffic – Many sites are poorly optimized for the search engines. Optimized anchor text links are essential yet completely overlooked by the majority of marketers. Time Factor – Most marketers do not take the time necessary to split test their site content. They have no system in place to automatically track and boost the Click Through Rate on their internal site links. Friends, the truth is that this is only the tip of the iceberg. 20% of the Marketers are making 80% of the money. You literally haven’t a chance competing against these marketer’s if your site is losing 95 out of every 100 visitor thanks to poor internal link optimization. What are the Highest Earning Internet Marketers Doing Differently? Google’s recent Panda and Penguin updates have decimated the lively hoods of many Internet Marketers. Sites that were once earning thousands per month on autopilot, suddenly didn’t earn a cent. With Traffic obliterated, CTRs decimated, and commissions eliminated once thriving sites are now worthless. Given the widespread nature of the problem I embarked on a detailed analysis pouring over thousands of statistics from both my self and other marketer’s sites. Using detailed statistics from link tracking software I put every element of a successful money making site under the microscope. I quickly discovered underlying patterns from the many different types of money making sites examined. Several months later I connected all the dots, and formulated it into a revolutionary WordPress plugin that is going to change how Internet Marketers make money online. WP Linkizer is a game changing WordPress plugin that is going to revolutionize your sites ability to earn you fat commission checks.. Effectively the Plugin will automatically create high conversion links inside your blogs content, and optimize those links to explode the Click Through rate and sales. Queue multiple anchor text phrases to rotate at each link location and display an even number of times. The system defaults to the link that gets the highest CTR thus maximizing your clicks and sales. Each time Google bot visits your site the anchor text will have changed. Google indexes your new anchor text phrases, thus optimizing your site for many multiples of keyword phrases. By virtue of its link rotation capabilities the plugin enables Latent Semantic Indexing, one of the most powerful on page SEO strategies. Detailed statistics reveal the pages views and click through rate on every link in your blogs content. This enables you to instantly see whats links are making you money, and for what products – as well as the links that need replacing. The plugin skyrockets EPCs and visitor value by exploding the conversion rate of your blogs content. Your sites will start appearing all over Google for multiple keyword phrases, thus maximizing site traffic, list sign ups, and sales. The plugin automatically turns your affiliate links into ‘cloaked links’. This in itself boosts conversion rates dramatically. Using solid niche research, combined with pages optimized with this plugin, I can reliably predict how well my pages will rank before I ever press the publish button – and its 100% white hat! I can do this because I’ve set each page up according to a meticulously developed and highly effective formula for on-page SEO that has taken me years of practice to perfect. If you want to jump to the top of competitive niches with minimal to no backlinking, you need an edge. From 22 total impressions to 22,000 and a top 20 ranking after using ClickBump SEO! to optimize her post for search! It starts with solid on-page SEO. If you are already using ClickBump Engine, you have a huge advantage over most all of your competitors (especially those who don’t have it) in getting your pages ranked as high as possible as quickly as possible. But if you want to ensure that your posts are reaching their maximum potential for outranking the competition, you need to fully maximize them. ClickBump SEO! ensures that you can do this, very quickly. What’s unique about ClickBump SEO! that sets it apart from plugins like “All In One SEO” and SEOPressor? *SEOPressor’s keyword decoration routine must process before the page can be delivered to the site visitor. ClickBump SEO! does all its processing when you save your post so your pages are delivered without delays. For starters, many of these plugins create a drag on the site because they rewrite each and every page just before the end user, your customer, gets to see it. This results in a delay or “drag” on the server and affects the speed at which your pages are delivered to viewers. What’s worse, the more traffic you acquire from your hard earned efforts, the more pronounced this effect becomes. This is especially true for SEOPressor since it has to run its routines, altering your post content with keyword decorations, before the server can send the finished page to the end user, and it has to do this on each and every page load, every time a user hits the page! With ClickBump SEO! all of the processing for each post is done while you are editing the post, not just before a user sees your content. And it only has to be done ONCE, not each and every time the page is loaded! So once you hit “Update” on the post/page editor, all of the SEO! suggestions are run on your content and you are done. What’s more, if you ever turn off ClickBump SEO!, your SEO optimizations stay with you. With Competing solutions like SEOPressor, many of your SEO tweaks disappear once you are finally forced to turn off the plugin or it conflicts with some other plugin you are running. Now includes LSI (Latent Semantic Indexing) Built Right Into the Software! Latent Semantic Indexing (LSI for short) is the secret sauce ingredient to getting and keeping your content at the top of the search engines. It has been hailed as one of the strongest indicators of a page’s ability to outrank and hold position against competing pages by respected SEO consultants such as Dr. Andy Williams, along with Lisa Parmley and numerous others. ClickBump SEO! is the first SEO tool for WordPress to offer integrated LSI keyword suggestions right alongside the editor window. You simply click the “Get LSI” button and ClickBump SEO! automatically retrieves and displays the top ranked LSI keywords for your target keyphrase, in milliseconds, right alongside your content editor! You can drag and drop your selected LSI keywords right into the editor. Each Post and Page is Analyzed for Critical On-Page SEO factors (some little known but highly effective secrets that are totally white hat) and given an SEO! Score from 0 to 100! You are then told exactly what to do to improve your score! With ClickBump SEO!, you can get an instant SEO! Score for each of your pages and posts as you edit them. The ClickBump SEO! Score is calculated using a skillfully refined algorithm that has been developed over years of research and trial and error with real world sites and Top 10 rankings in highly competitive niches. Checks all the most critical on-page SEO factors including some you’ve likely never even considered that have a definite impact on your page’s ranking. The tool analyzes keyword placement and location within the text, as well as the exact markup needed to rank at the top of the search engine, including step by step instructions for every critical suggestion it provides. Its the closest thing to having an SEO expert optimizing every post and page on your site. Allows you to easily update or change your page’s target keyword phrase without leaving the editor and automatically updates your SEO! Score against the keyword phrase. Provides specific suggestions to improve your SEO! Score on each page. ClickBump SEO! is ideally suited for the novice WordPress publisher or even the Web publishing expert who has little time to fully analyze each and every page. It automatically evaluates your post content and presents the results in an easy to read bulleted listing along with suggestions that you can immediately implement to improve your rankings and SEO! Score. As you can see from the above screenshot, the ClickBump SEO! panel provides a quick snapshot of your page’s on page SEO factors as well as specific suggestions on how to fix the problems and increase your rankings and SEO! Score. You will quickly be able to go from zero to 100 in a few minutes. Adds your Keywords and SEO! Score for all posts and pages to your Posts and Pages listing so you know, at a glance, which ones need work. ClickBump SEO! is a standard WordPress plugin that has been tested for compatibility with the latest WordPress release. When you receive your download package, just unzip it and install it like any other WordPress plugin. It becomes active immediately for all your posts and pages. It even provides a handy addition to your Posts and Pages listing to see at a glance what each of your posts are doing in terms of keywords and SEO! TRAFFIC CRUSHING MODULE to generate a MASS of visitors, crushing your hosting and giving you all $$ you want and get on the TOP of the every search engine with your keywords! We develop one of the TOP best traffic seo tools that you can find on internet. We are helped many to get on first page of google and other search engines with our great tool. GET on the TOP and earn much more with this great product! Not only you increase your Alexa rank, and therefore the value of your ads, but also create an important buzz, which boosts your website in organic search. It is known that busy website do better in Search engines result pages as well. This traffic module is not for people who have sales web sate and want instantly to increase their sale. Only to increase organic search and to increase rank! It is 100% safe traffic. Non-Bot traffic! This traffic is safe on all search engines. Start with making traffic now! You just need few seconds to generate code, insert in your page and you are ready to go!!! Each visit on your site will be multiplied through our service, so you get at least 2x visits and random unique visits from other our customers who already use this module. More sales means more visits to your site. Big advantage of this module is that you can share all your traffic on other your websites (eg. you have 3 websites you can share traffic to them and make your traffic wheel). It is recommended to have landing page for lower bandwidth and faster loading of shared sites. AL READY 1176 USER USE THIS MODULE! That means that installing this module you will instantly start receiving mass traffic on your web site!!! How to share my traffic? When you logged in module, you select how many address you want to share your traffic. How do I insert code in my web page? Get code and insert that code in your webpage (eg if you using wordpress just insert code in footer.php file ). After you insert code in your webpage, when you get a visit on your webpage it will automaticly make visits on your other pages and you also get 2-3x visits on your page from other users that use this module. Can i insert my keywords? In case that you using landing page its recommended to insert keywords meta tag description and your ads. HOW THIS TRAFFIC WORK AND IS IT SAFE?? We have a large network of sites that send traffic to each other, providing real unique visitors to your website, absolutely NO SPAM is used to obtain that traffic. This traffic module is used to improve your Alexa rank, ads value, web site value, and organic search. No Bots, No Software, Different IPs from various countries, this traffic looks natural in Google Analytics. This traffic guarantees the increase of Alexa and Complete ranks. Interspire’s email marketing software is fully featured and was built specifically to help automate your follow up marketing, giving your sales team more motivated leads in the process. It will turn more leads into buyers – we guarantee it, or your money back. 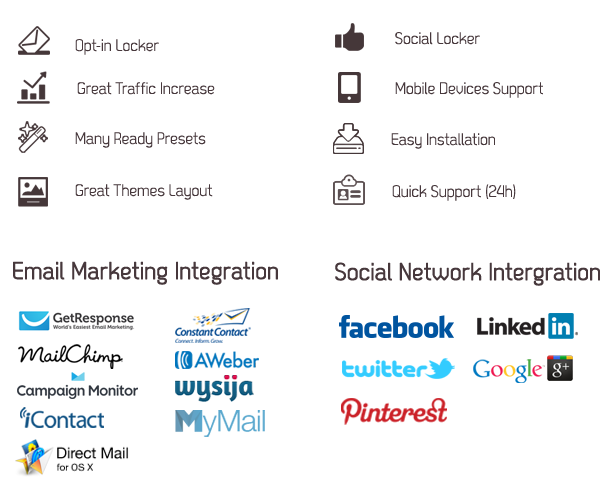 See the entire feature list for a complete overview of Interspire Email Marketer. What’s New in Interspire Email Marketer 6? See new features in action: Watch this video to see what’s new in Interspire Email Marketer 6. Dynamic content blocks allow you to personalize a section of your email message based on custom field values. For example, if the subscriber’s hobby is golf, you can show a golf ball. If it’s hockey, you can show a hockey stick, etc. User groups make it easier to manage your Interspire Email Marketer user accounts if you’re a web designer or agency with clients. Conversation system to send messages to other users. CS-Cart is crammed of great features. They make the shopping cart powered stores both attractive and friendly for customers and easy to maintain for administrators. That’s why over 30,000 stores around the globe use it! CS-Cart Ultimate is an advanced edition of CS-Cart that allows you to set up and manage *multiple* online stores via a single common administrator panel. Specially designed to make multi-store management easy and flexible. With Ultimate Edition you can manage all your stores from a single administration center having full control over each store. Storefronts can be treated both fully independently or as a whole interconnected network with shared products and customers. This script is an powerful exchange system for Facebook, Twitter, Digg, Youtube, Google and Web Traffic and many features! Need Powerful Exchange System Pro? This is a fully functional program that will track the position of web sites in Google and Bing (set up for United States) through an intuitive Campaign Manager. The application is set up to track the first 50 SERP placements and will keep records of where the placement was at each day so that you will have historical records of your search engine rankings to make informative decisions about your SEO initiatives. With this rank tracker, you can track an unlimited amount of campaigns and competitors. Not only does the program track and record the rankings, but it also has a beautiful Twitter Bootstrap and jQuery front-end to make your job even easier. Rankings are presented in DataTables, with a comparison to see where the rankings were previously (yesterday, last week, last month). You can also easily pull up a line graph depicting where the rankings have been previously. The program is even set up to use private proxies! A video walk-through is included for a quick and easy install. Please note: the use of proxies is recommended if tracking many keywords as there is no way around captchas in the script. In addition, if you receive a captcha anytime you do a request to either google or bing from the IP you wish to run the script (not likely), Proxies are required. If you have any questions, please let me know before you purchase the script. In addition, as this is a bit of a complicated script, please do not be afraid to let me know should you have any issues and I will do my best to get you up and running as soon as possible. If you are wanting to do more than 50 keywords/day (may be more or less), you will need private proxies to support the scrape.